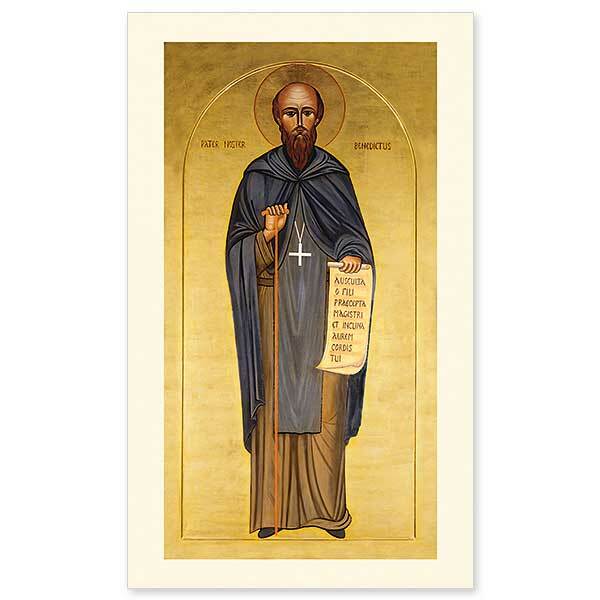 This icon is a full-length image of the founder of our Benedictine order that now graces the right side aisle of our Abbey Basilica. Saint Benedict, dressed as a Benedictine abbot, holds a scroll symbolizing his famous Rule for Monks. The words written upon it in Latin are those from its very beginning: “Listen carefully, my son, to the master’s instructions, and attend to them with the ear of your heart." Upon the occasion of the renewal of our Abbey church, the Basilica of the Immaculate Conception, our community commissioned a beautiful pair of icons from Sister Marie-Paul to grace the head of the side aisles. 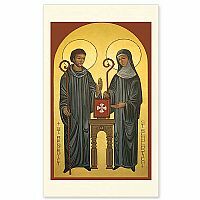 This one is a full-length image of the founder of the Benedictine order. The other is of St. Joseph holding the Christ Child. 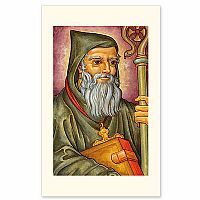 Saint Benedict of Nursia lived in Italy from about 480 to 547 AD. 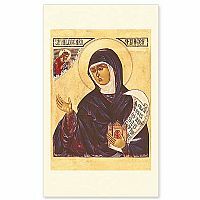 He was not the founder of Christian monasticism, but he made an enormous contribution to it by writing his Rule of St. Benedict, still used by a great many monasteries and convents around the world. 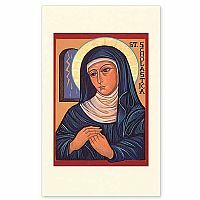 Most of what we know about the life of Saint Benedict is found in The Second Book of Dialogues written by Saint Gregory the Great, a Benedictine monk and Pope from 590 to 604. Gregory was born before Benedict died and had access to monks who knew him. However, the purpose of St. Gregory�s book was to educate and inspire believers, not to record biographical facts. 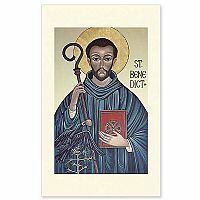 No one knows what Saint Benedict looked like. The face presented to us here is symbolic in the Byzantine manner. The forehead is very large, indicating wisdom and intelligence. The nose is drawn long and narrow to represent nobility. The mouth is small and closed in the silence of spiritual contemplation. The flowing beard indicates age and experience. The eyes stare straight ahead toward the viewer, but they are focused on Heaven.